This month's Love Me Beauty box sees some new and very different products included - let's take a closer look of what I received in my May (Menu 1) box. Oh these are so cute! I'm a stationery addict - pens, notebooks, post it notes, stickers, you name it, I'm probably obsessed with it. I haven't heard of GO Stationery before though, but this little set of handbag sized notebooks are just adorable. Pretty baby pink shade - perfect for Spring/Summer. I think this would look great on toes! I'm always, always happy to get a new lip balm to try out and had this brand on my wishlist after seeing them mentioned in a few blogposts recently. Interested to see how this 100% natural formula compares to the likes of Burt's Bees. If mint isn't your thing, there are two other flavour options to choose from in the menus available this month. I'm sure Love Me Beauty have been reading my mind this month - I've also had this sampler set on my to-buy list as I've seen a lot of raves about this brand but had yet to try anything from them. Very excited to give these balms a go! 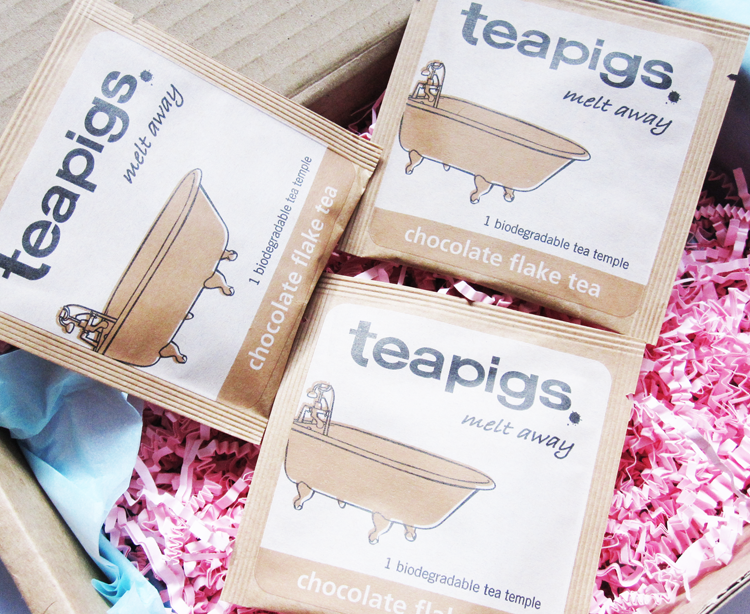 Tea Pigs are one of my favourite tea brands and Chocolate Flake is one of the yummiest flavours that they do! It really does taste like you've dunked a chocolate flake stick and swirled it around in your teacup, but of course minus the extra calories. Genius and delicious! 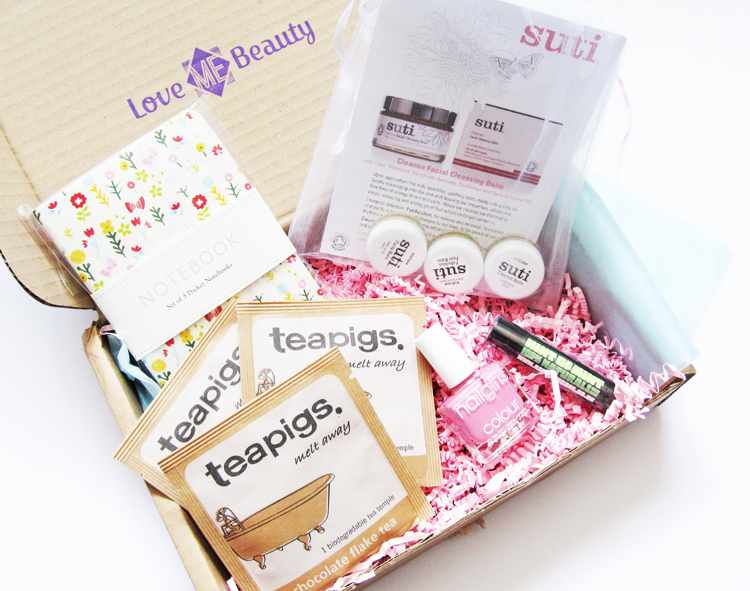 Summary: I love this month's box! I don't know whether Love Me Beauty will be including lifestyle products as a permanent addition to the boxes or if it's just a one off, but personally I enjoy receiving a mixed variety of goodies. What are your thoughts? This looks like such a cute box! I love that they've included little notebooks too. Fab review and great post! I agree, the little lifestyle extras are great! I think I'd be a little annoyed at the notebooks haha. 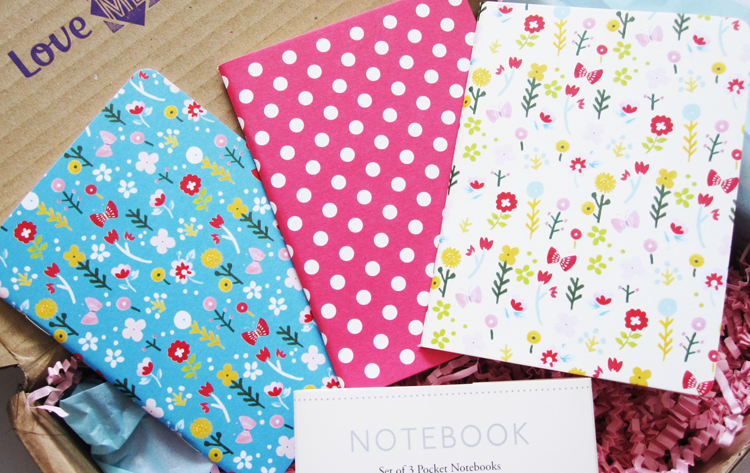 Ah I can understand that - there have been a few people unhappy with their boxes this month because of the notebooks! I read another review about this just a few posts ago and I love seeing your different opinions on things. Your photos are freakin' fantastic too. That sounds like such a weird flavour of tea!